For recording the Oasis’s 1994 debut album “Definitely Maybe” Noel used Epiphone guitars, mostly because he was unemployed prior to recording and was not able to purchase a Gibson. This was a stock Epiphone Les Paul in cherry sunburst. It can be seen in Supersonic music video. (timestamp : 0:44) Early Oasis gigs were also played with this guitar. Famous ["Splash" gig](https://guitarplayer.files.wordpress.com/2008/06/noel_94.jpg) was played with an Epiphone Les Paul Standard. 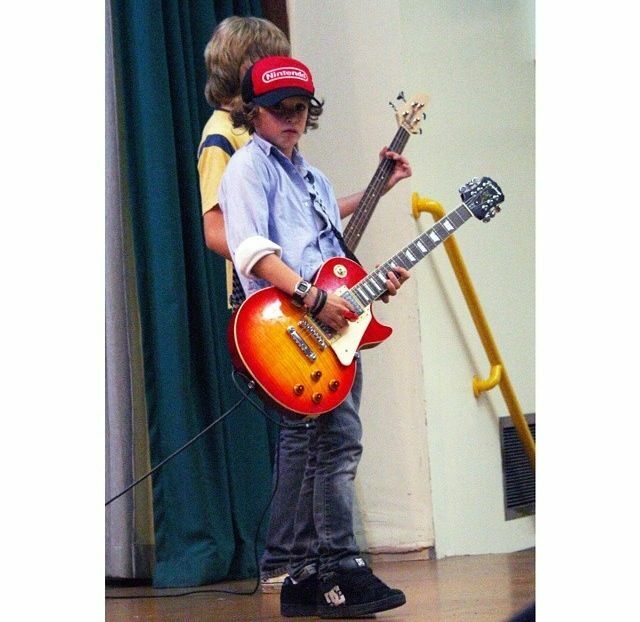 A young Bradley Simpson used this guitar to play Sweet Child O' Mine. Classic beefy Les Paul tone, without the panic and caution necessary as an owner of a Gibson. It stays tuned like a champ and holds up surprisingly well in tropical conditions. Wish they came with whammys, but for some straight up licks, this is your boy. Usually have mine setup with 10s and jump between pickup settings as needed. It's not a Gibson, but... Sounds like one. This is the real deal if you want a very good sounding Les Paul and don't want to spend maybe 4-5 times its price to have a different logo on the head stock. I had to adjust the pickups slightly (lower the bass and raise the treble) and adjust the intonation after changing to a different string gauge, but nothing I couldn't handle with ease. My first guitar, I still use it, It was essential for me to learn how to play. Plays well, doesn’t look the way I want it to. Heere’s the deal. I bought this guitar in Septemper 2017 (It is now February 2018). When I brought it home I loved the feel of the 60s neck and the fretboard felt great. The build quality was nice and it didn’t feel cheap at all (I got it for about €450). I didn’t really think about the finish during the months that followed. Recently however I’ve realised that It really isn’t for me. I bought the honeyburst version and I think the finish is very well done, it just isn’t for me. I primerarly play trash and metalcore but I ocassionally throw in some blues licks. The guitar, I feel, can play every genre of music, but the finish itself doesn’t quiet fit in. It doesnt get you in the mood to play metal and in probably shouldn’t as it isn’t a very ”metal looking” guitar. I don’t have much to say about the pickups. They sound fine. They are not very high output pickups but they will do their job and cover a wide area of music. In summary I suppose I just want to have said that this is a high quality instrument and if you play blues/rock this might just be the instrument for you. The thin 60s neck will work great for someone with smaller hands who maybe isn’t very used to thick necks. Personally I don’t like the honeyburst finish but that shouldn’t put you off from buying this guitar.